The mutilated images in Tate Britain’s Art Under Attack are a sobering reminder of what we’ve lost, but it’s a shame the show loses its way halfway through. Is there a more relevant or telling topic in British art than iconoclasm? I certainly cannot think of one, having barrelled round Tate Britain’s engrossing and often successful investigation of this juicy subject. Consider the facts. For the best part of a millennium, Britain was a Catholic nation that took its artistic lead from Rome, packed its churches with images of Jesus and the saints, and understood its religious impulses in splendid and uplifting colour. Our worship was sensuous and thrilling. Our art was gaudy and vivid. Then along came Henry VIII. Henry’s appetite for divorce had devastating consequences for British art. The iconoclasm triggered by the break with Rome — not just in Henry’s time, but in the waves of destruction that followed — achieved an almost total eradication of British art so far. An entire national narrative was rewritten. A complete aesthetic history was removed. According to the Tate’s estimates, 90% of Britain’s religious art was destroyed in the surges of religious anger that followed the dissolution of the monasteries. It’s a terrifying calculation. I suspect the figure was even higher. The first great wave of iconoclasm, instigated by Henry and followed up ruthlessly by his successor, Edward VI, concentrated on the churches and their power structures. The second wave, during and after the Civil War, in which Charles I and his royalists were defeated by Cromwell and his Puritans, was aimed more specifically at the imagery itself. Paintings were trampled. Statues attacked. Holy windows smashed. Frescoes scraped down. Those Jesuses that did not have their heads knocked off had their eyes gouged out. Those Madonnas that were large enough to be useful were broken into smaller pieces and re-employed as brickwork. No nation anywhere, at any time, has had to suffer as thorough a destruction of its artistic heritage as Britain did in the pitch-black cultural years examined here. Making a show about the loss of art when this much art has been lost is a keen test of curatorial intelligence. And for half of its length, this event has a decent stab at it. One of the few advantages the Tate has here is that those objects that did survive the carnage radiate a force 10 gale of pathos and are profoundly affecting. When you consider how many wooden crucifixes there must once have been in Britain, then contemplate the only scrawny torso of Jesus that remains, from the British Museum, not only does the scale of the destruction become instantly tangible, but the tiny Jesus — a thoroughly ordinary object in its time — seems to enlarge before you into a wounded idol of tremendous power and heft. Most of the tiny bits of jigsaw on show here survived accidentally, cemented into the walls as rubble, dropped into coal bunkers and forgotten. A particularly impressive line of fragments from the great screen at Winchester Cathedral — a lovely Madonna and headless Child; a bearded face of God — hints at how skilled and developed British sculpture was before the Tudors took a hammer to it. Heaven knows what larger truths about British art were also smashed into illegibility. Any subsequent history of British art has no choice but to be thoroughly misleading. All this is calmly summarised in a display that has dug up lots of fascinating titbits about the progress of British iconoclasm. It was interesting to see, for instance, how some images were painted over with biblical texts as Britain began its famous transformation into a literary culture rather than a pictorial one. Other exhibits remain intact, but transformed by the marks of censorship gouged into them by the iconoclasts. 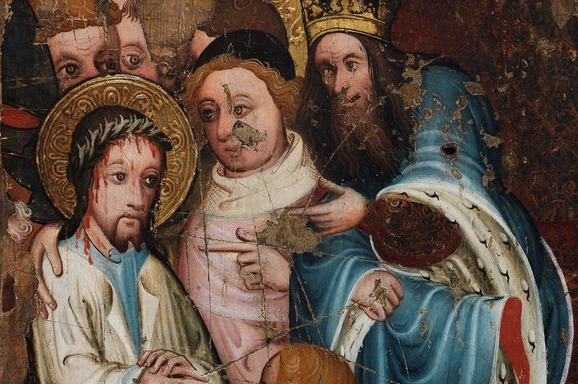 Thus, a small church panel from Cambridge showing Christ Before Pilate, painted c1400, has had vicious knife lines scratched across its surface, turning it from a run-of-the-mill religious image, of which there must have been many, into a unique piece of artistic evidence, throbbing with accusation. The show only starts wobbling when it begins an irritating and typically Tateish search for pathways that will lead it to contemporary art. The 18th and 19th centuries are brusquely skipped over. With so little genuine iconoclastic action going on, we are left with a threadbare assortment of tales about public sculptures that annoyed the locals. A statue of William III that stood in College Green, Dublin, was attacked scores of times before the IRA finally blew it up in 1929. George I, meanwhile, had polka dots painted all over him and was given a dunce’s hat to wear before he finally fell apart on his pedestal in Leicester Square in 1872 and was sold as scrap. A more serious minus is the effort to remain curatorially right-on, which causes the exhibition to change attitudes at will. Until the arrival of the suffragettes, iconoclasm is always presented here as a destructive and regrettable force. But as soon as they start wielding their meat cleavers and waving their toffee hammers at art, it is suddenly the only way to achieve a rightful cause. “For the suffragettes, the idealisation of inanimate objects while real women were treated with indifference was the real outrage,” instructs a hopeful wall text. Hah! I’m with Wyndham Lewis on this one, and the thoughts about the suffragettes expressed in the pages of the vorticist manifesto. The slashing of Velazquez’s Rokeby Venus by Mary Richardson in 1914 was every bit as regrettable as the clubbing to pieces of the stained glass at Christ Church, Oxford, in 1648. Also unconvincing are the attempts to yank the story up to date by retelling the tales of recent attacks on art. Carl Andre’s notorious Equivalent VIII, aka The Bricks, is included here, with a résumé of the insults thrown at it in the press and a description of the paint-splattering that speckled it with blue in 1976. Silly and regrettable though they were, these philistine attacks on modern art are hardly of the same order as the destruction of 1,000 years of British pictorial history described earlier. The worst moment is the final one. As their parting thought, the curators have chosen to present destruction in contemporary art as a creative act. And who should pop up but the Chapman brothers, scrawling funny faces onto Victorian portraits acquired in car-boot sales? Now I am a Chapman brothers fan. But when you slash a knife across the face of Jesus or turn a holy relic box into a saltcellar, as some anti-papist British goldsmith did in the 17th century, you display religious hatred of an entirely different order from the artistic cheek displayed by the Chapmans when they began adding naughty moustaches to Victorian faces. One thing British iconoclasm certainly was not doing during its terrifying journey of destruction was playing cultural games. To suggest any valid link between the smashing of the stained-glass windows in Canterbury Cathedral in 1643 and the art antics of the Chapmans is to display appalling amounts of cultural insensitivity.